Welcome Groups to our Barrier Islands! 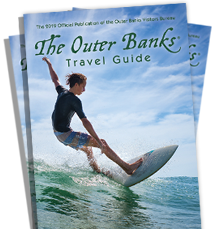 Since the late 1500&apos;s the Outer Banks of North Carolina has welcomed groups with open arms. From the first English explorers to the Wright Brothers, on the Outer Banks of North Carolina hospitality has always been first and foremost. In 1900, Bill Tate, Postmaster of Kitty Hawk, NC, told the Wright Brothers: "If you decide to try your machine here & come I will take pleasure in doing all I can for your convenience & success & pleasure, & I assure you will find a hospitable people when you come among us." The Outer Banks is a perfect setting for group tours, corporate meetings, school groups, church groups or family reunions, the Outer Banks is a place of discovery and adventure; known as the Graveyard of the Atlantic it is also where the first English colonists visited the new world. Here, in a land where we balance our rich natural setting with a vibrant vacation destination, adventurers and thrill seekers still venture in search of their dreams. And, like the Wright Brothers, they&apos;re captivated by the breathtaking beauty, rich history and abundant cultural resources. As you can see, The Outer Banks of North Carolina offers the kind of variety suitable for any type of group. To plan your next meeting, group tour, or sporting event, please call Lorrie Love at (877) 629-4386 or email at love@outerbanks.org.We look forward to hearing from you soon!